At any other restaurant in the nation, lunch hour traffic is at its peak. But for two minutes at every Mission BBQ location, work stops. Employees and patrons alike stand at attention for the playing of the National Anthem. “Our best two minutes of the day are when those cash registers aren’t ringing,” said Bill Kraus, co-founder of the BBQ restaurant. 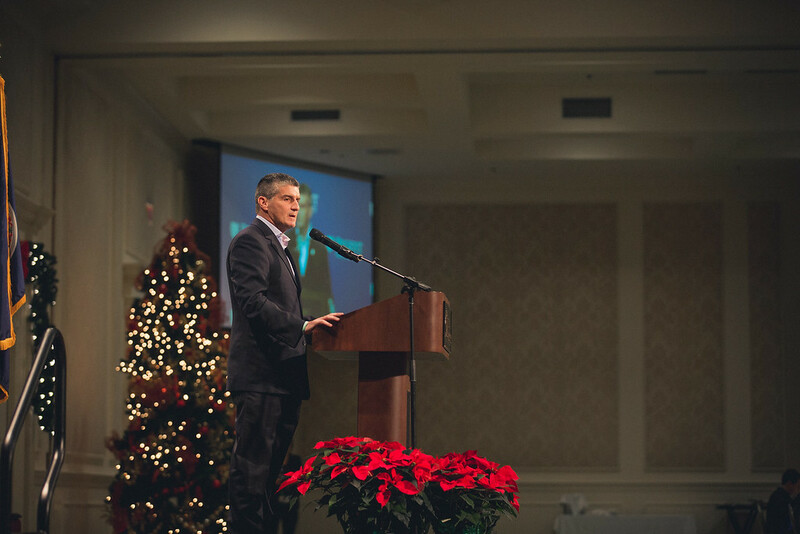 He shared the “why” behind the patriotic mission of his business at Regent University’s Executive Leadership Series on Thursday, November 29. It’s also indicative of a successful business model. The chain restaurant currently has 55 locations; and Kraus anticipates doubling that number within the next two years – all without a drive-thru, freezer or microwave on the premises of any of their stores. Founded, with every ounce of intention, on the ten-year anniversary of 9/11, Mission BBQ goes beyond merely selling food, but seeks to honor those who serve in the Armed Forces and first responders. Frequently, store locations adorn their walls with relics from those who’ve lost their lives in service. Beyond honoring the memories of those who’ve lost their lives in the line of duty, Mission BBQ donates an estimated 3 million dollars a year to various nonprofits geared toward military, fire or police organizations. Mission BBQ’s latest initiative, which began in its Virginia Beach market, is feeding American troops located throughout the Middle East, Africa and Afghanistan. Their food is smoked, cooled, frozen and packed stateside and loaded onto a military transport. And though he’s never had first-hand experience in the military, through his life’s work he’s learned that there are a multitude of ways to serve and give back.